“Waffle makers” have been very popular since you can instantly make waffles with it, or even sandwiches. 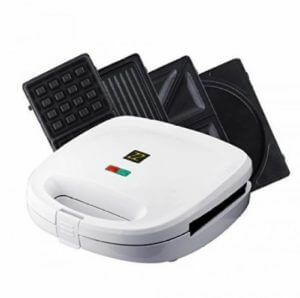 A lot of brands such as Imarflex, Cuisinart and Tescom have their own versions of electric and non-electric waffle makers, with different plate styles. It gets a bit confusing to choose just the right one, doesn’t it? We will introduce to you the pointers in choosing waffle makers, compare the products available online, and show you the top products in rank order. Find the perfect one for you, and start cooking hot yummy waffles! 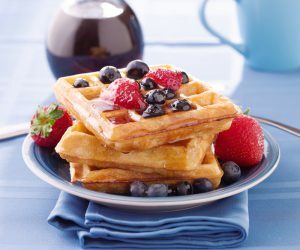 To make delicious waffles, find the best waffle maker! Learn first how to choose waffle makers! Waffle makers can be divided into 2 major categories: “Electric” and “Non-Electric”. We will show you first the pointers in choosing for each of the type, and then the pointers that apply to both categories afterward. You just need to pour in the batter and then turn it on to make a waffle with an electric waffle maker. It is safer as there will be no fire involved. You need to preheat it though, so cooking time takes about 10 minutes. Higher wattage means higher power, and can shorten the time you need to create a waffle that is crunchy on the outside and soft on the inside. If you want to make delicious waffles, go for high wattage waffle makers. 900W can be considered very powerful. 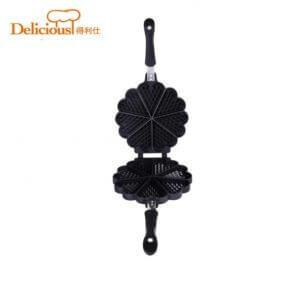 One of the best things about electric waffle makers is that it allows you to make different kinds of food such as hot sandwiches, hotdog waffles, etc. Choose the product that comes with the plate that you like! If the plate is changeable, then it means you can detach it and wash it separately. Meaning it will be easier to clean them afterward. 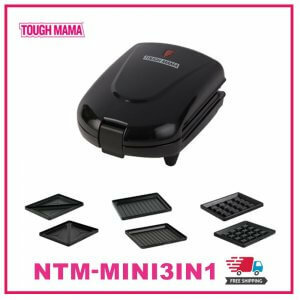 You can adjust the cooking time, the crunchiness, the temperature and even the small details with the “Non-Electric” waffle maker. Cooking time can be shorter than the Electric type, at around 5 minutes. You can make waffles anywhere as long as there is fire, even at campsites or during outdoor activities. There are those that can only be cooked with “fire” so if you are using an electric stove, check if the product is compatible with IH burner. When using a non-electric waffle maker, you will be dealing with fire. Make sure it is safe to use, especially the handle where you will be holding them. Choose the product that has a resin material coating on the handle, to protect your hand from heat. From here, we will be discussing you the points that are applicable to both “Electric” and “Non-Electric”. First will be the size. Think about the number of waffles you want to make at a time. 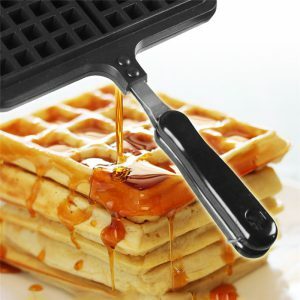 If you want to make waffles for the entire family at once, choose the product with about 20 cm width or wider and those that can make 2 waffles at one time. Although, a waffle maker that is too big, will mean harder preparation time and cleaning time. You may be fine with it at first, but using it will be troublesome little by little. Keep that in mind too, and choose the perfect size for you. When choosing a kitchenware, ease of cleaning will always be one of the priorities, right? It is recommended to choose those with non-stick surface like fluororesin coating, for easier maintenance. Did you know that there are two types of waffles? The “Brussels type” is rectangular in shape and is soft. “Liege type” on the other hand is round and hard. 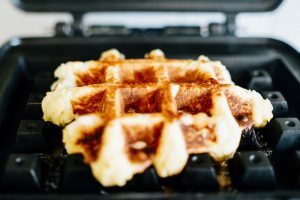 Basically, you can make both types of waffles with a waffle maker, but if you want to make the “Liege type”, it will be best to choose those with deeper grooves. The heat can go through the batter better, resulting in a crunchier waffle. There are also waffle makers with plates that have dividers. This type is highly recommended if you plan to make small waffles for everyone. We finally move on to the product ranking. We made 2 rankings by type (Electric and Non-Electric). Let us look into the best products available online while keeping in mind the pointers discussed earlier. First is the Electric type, where everyone can easily make a waffle! If the number of your family is 4 or more and you need to make many waffles, this waffle maker is highly recommended for you. 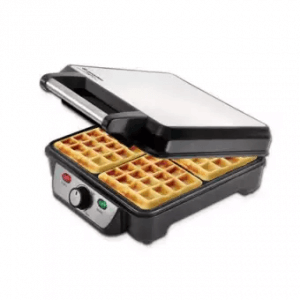 You can make 4 waffles at once with it, while making them crunchy on the outside and soft on the inside because of its 1100W power. It also has a cool touch handle, so children can enjoy making waffles with their moms. This product is the best choice for a family with many kids. We are not even sure if waffle maker is the correct term, as it can make pretzels, doughnuts, crepes, cookies, and many more. You just need to replace the plates, and then you’re good to go. It can also be stored vertically to save up storage space! A downside of this product is its price. Can be too pricey for a household item. Though if you’re planning to start a business in the future, or become a vlogger or youtuber, this may be a good investment! 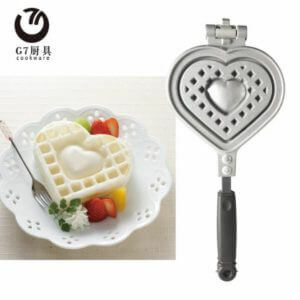 This 850W waffle maker has 5 heart shaped plate. You can either make 5 small heart-shaped waffles, or 1 big flower shaped waffle. Either way, this will surely bring smiles to everyone at the table. It has a non-stick plate and an easy to clean smooth surface. Highly recommended to those who want to surprise their loved ones with heart-shaped waffles, or for mothers who want to make their kids smile on Sunday mornings or any day for that matter. Compact Design That Can Make 2 Slices At Once! 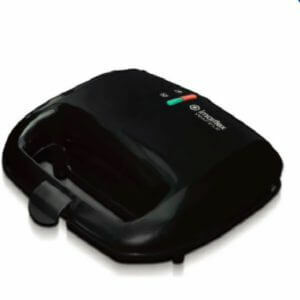 This 700W waffle maker has a Teflex non-stick coating pan, that you can easily detach for cleaning. It has a compact body so you can store it easily when not in use, and easier to bring out too whenever you want to use it. This also comes with 1-year supplier warranty. Highly recommended for people with kids, because it has a cool touch body, safe for accidental touches. 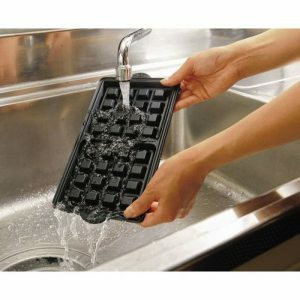 Also perfect for waffle newbies as it is very simple to use and very affordable. This is perfect for those who want a waffle maker with few more functions, but don’t really need too much. Having more than 5 plates can be great but it takes up too much space, especially if you’re really not into cooking that much. This 520W waffle maker comes with 3 plates that can create waffles, donuts and brownies/muffins. Just enough variety for a simple family. Next, we are going to introduce to you the top 5 non-electric waffle makers, where you can make detailed adjustments on how you want your waffles done. Make Your Special Day Extra Special with This! This is the perfect tool to make your loved ones or your significant another smile on a special occasion. 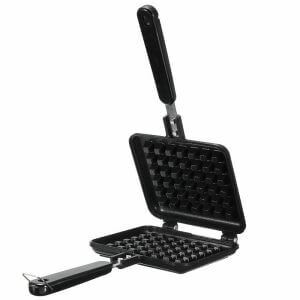 It has all the basic things you need in a waffle maker, the handle is heat resistant and lightweight. The best part about it is its shape, obviously. Though there is nothing more special about it aside from its shape. The surface is not stick-proof, so you might want to use a little oil when making waffles with it. The hardest part of having a big family is all the morning preparation. Preparing to go to school, the bathroom rush, the washroom wars. Don’t let cooking breakfast be part of the riot. 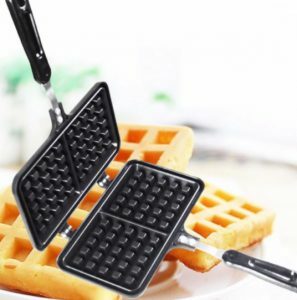 With this waffle maker, you will be able to make 4 waffles at once. One bad thing is that it is heavier than the other waffle makers. Naturally, they are bigger, so they are heavier. At least you only need to use them for a shorter period of time, since you can make 4 at once. If you’re bored with the old-fashioned square or circular waffles, then this waffle maker is for you! It also has an electric version, but if you prefer the non-electric type for more heat control, you need this product! You can make 7 heart shaped waffles at once, perfect for waffle parties, or for a family with 7 members in it! You can save a lot of time cooking with this goody. One of the hardest parts about making waffles with non-electric waffle makers is getting the waffles out. 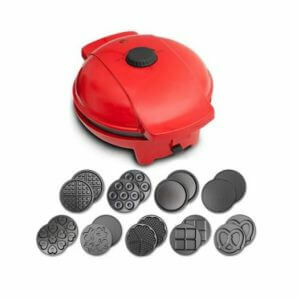 A non-stick material is a must with non-electric waffle makers. 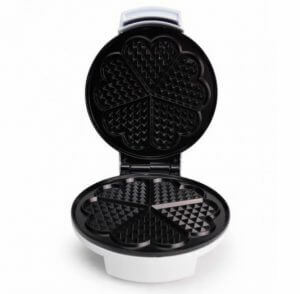 This waffle maker is not only non-stick, but it is also compact and can easily be stored. 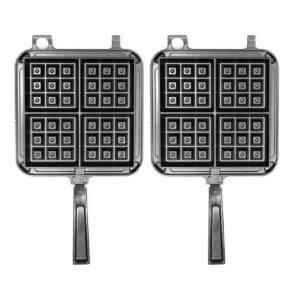 Though this product is not compatible with IH, you can still make great waffles, 2 at a time, with your stove top, or even campfire. The best thing about this product is it does not have a divider. You have all the space to let your creativity work its way. You can make one big square waffles with it, or make circular waffles, roll a hotdog inside the big square waffles, etc. The handle is heat resistant, and is removable too, for easier packing when you are going camping, or easier storage. This is made with Aluminum Alloy and is very lightweight. We showed you the top waffle makers available online. How was it? If you have a waffle maker, you can make dessert waffles with fruits and chocolates, and at the same time make a less sweet waffle that you can eat as a meal. You can also try making a sandwich using potatoes, bread, etc. A lot of recipes and arrangements are available now, so why don’t you try them out and enjoy your life with delicious waffles!